My office phone is 523-6878, and you can send me e-mail at Jim.Swift@nau.edu. My office is AMB 110. My office hours are Tuesday 11:30-12:30, Thursday 2-4, and Friday 12:45-2:45. Please feel free to contact me in person, by phone or via e-mail with any questions about the math, or with any feedback about the class. Text: Calculus, Early Transcendentals, 3rd edition, Rogawski and Adams. The bookstore sells an NAU looseleaf version. Paul's notes, by Paul Dawkins of Lamar University. Here are the links to his Calc I and Differential Equations notes. The Wikibooks Calculus textbook is pretty good, too. Here is a link to NAU policy statements, and the math department policies. These are part of the printed syllabus for our course, but are not in the on-line version of our syllabus. Introduction to WeBWorK at NAU. Because CEFNS paid for a site license, you can now get Mathematica on your own computer! Details are at http://nau.edu/CEFNS/IT/Wolfram-Mathematica/. This is a good webcast introducing you to Mathematica. Link to a page about Greek Letters. Flyer for FAMUS (Friday Afternoon Undergraduate Math Seminar): Friday at 3 pm in AMB 164. This is a good place to do the WeBWorK. There are Peer Math Assistants (PMAs) that can help you. You can go there before or after class with your friends and work on WeBWorK together. M-Th 9:00am - 5:00pm, F 9:00am - 4:00pm, except when the lab has been reserved at least a day in advance for use by a class. This has more computers available than the MAP room, but no tutors to help. 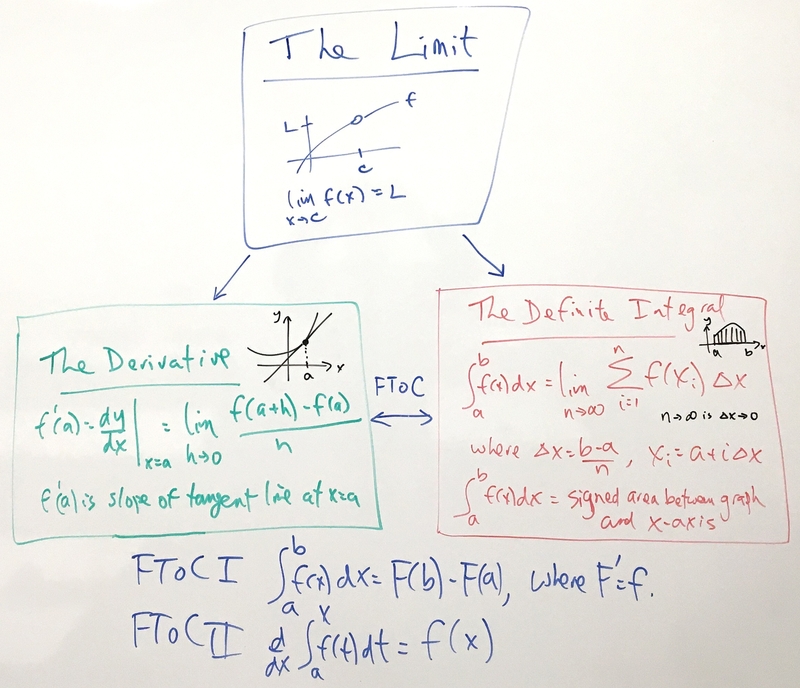 The current Problem of the Week is posted here. You get extra credit for our course from points earned in the problem of the week. Friday, April 26: My office hours today are shortened to 12:45-2:00, due to UGRADS (Undergraduate Research and Design Symposium). Check out UGRADS, in the field house 9-11am and 2-4pm. cos(x) = 1 - x2/2 + x4/4! - x6/6! + ... .
Monday, April 15: Here is a pdf of the formula sheet I will hand out with the exam. Wednesday, April 10: Here is a Mathematica demonstration of the Taylor polynomials for 1/(1-x). Here is a picture of some partial sums of the Taylor series of ln(1+x) = x - x2/2+x3/3 - x4/4 + ... . The series converges iff -1 < x <= 1. Here is a picture of some partial sums of the Taylor series of 1/(1+x2) = 1 - x2 + x4 - x6 + x8 - ... . The series converges iff -1 < x < 1. Here is a picture of some partial sums of the Taylor series of arctan(x) = x - x3/3 + x5/5 - x7/7 + x9/9 - ... . The series converges iff -1 <= x <= 1. Tuesday, March 26: Here's a link to Zeno's paradoxes. I'm extending the Spring break extra credit: You can turn it in by Monday, April 1 in class (no foolin'). Monday, March 11: Spring break extra-credit project: Does Newton's Law of Cooling hold for this data?. This can get up to 10 class points (the same as one webwork). Due the Tuesday after Spring break, at the beginning of class. Monday, March 4: In-class handout on Euler's Method (pronounced Oiler's method). Here is what the slope field applet should look like when you change the settings. Wednesday, Feb. 27: Here is a Slope Field and Direction Field applet by Darryl Nester of Bluffton University. The hyperbolic sine and cosine are defined by cosh(x) = (ex+e-x)/2 and sinh(x) = (ex-e-x)/2. It follows that cosh(0) = 1, sinh(0) = 0, cosh is even, sinh is odd, andd/dx cosh(x) = sinh(x), d/dx sinh(x) = cosh(x), and cosh2(x) - sinh2(x) = 1. Here is a picture of part of the infinitely long Gabriel's Horn. You might want to look at the wiki page on Gabriel's Horn. Tuesday, Feb. 5: Reviewing this Required knowledge from Precalculus might help with the exam. Tuesday, Jan. 22: Paper Football and How to make a paper football. This meme shows a common error. What is it? What is the corresponding common error for integrals? Review problems on Differentiation and Integration. and the scanned solutions (with one solved problem using partial fractions that is not part of the review).